Yet again, my holiday at home has come to an end. How does this happen every year? It's been a great one, but now it's time to jet off through England's grey skies and reacquaint myself with the Vinodogs...and that thing called work! So goodbye Blighty. What a wine shop! The Vini Liquori Vanni, across from the fountain on the Piazza San Salvatore, Lucca, is a great establishment for any oenophile to visit. The above ground part of the shop has a fairly extensive inventory of wines from all over Tuscany, including the wines of Lucca from the Comune di Montecarlo about 8 miles east of Lucca. But it is the cellar of this extraordinary establishment that had me oohing and aahing at every turn of every corner in this subterranean vino-paradise. I wasn't the only impressed person in the cellar (actually this was my second visit and on my first visit I had had the entire place to myself). From the very depths of this brick-and-bottle clad cellar, I heard the strains of American accents (oohing and aahing also), so I made my way towards them. Three Chicagoans were on a mission to find a bottle of Castello Di Ami, 1999 L'Apparita to add to their collection. I know this because I had a quick chat with them, but there was no eye contact as we were all too busy looking at great wine. I had already done my meagre wine-shopping (weight restriction, drat), so I didn't buy anything. However, the folks from the Windy City were last spotted making their way up to the cash register, cradling some vinous plunder in each of their arms. What a wonderful place. Lucca is one of the best places I have ever visited. This fortress-city founded by the Etruscans, enclosed by Renaissance era walls - whose wide tops look out over the town’s many towers, piazzas and gelato shops - is a great holiday destination. A quick flight from Liverpool to Pisa and my family OTW and I found ourselves in a place that hasn't changed must over the past 500 years. Lovely architecture - with some bits of Roman wall still visible - great history, good food, wine and the aforementioned gelato...what is there not to love about this place? The people are friendly too. As a whole, the Lucchesi seem to be a mellow bunch who take time to stop and smell the roses...and colour coordinate their laundry. Now, that's my type of people. Where in the world is Vinogirl? Seconde parte. Looks can be deceiving. What seems to be a pleasantly sunny, late spring day on Liverpool Bay was in fact one of the coldest, windiest days I have ever experienced at home. Stepping around the corner of a building to take this photograph I had to really lean into the wind for fear of being blown over. Even a glass of a so-so rosé of Tempranillo at a nearby establishment could not fully chase the English weather-blues away. Well, that's not strictly true. The sight of a familiar coastline stretching out before me was a tonic for my seaside-deprived eyes...at least it was when the wind wasn't whipping my hair into my eyeballs. Ouch! Well, it really wasn't that nasty, I just like the rhyme, but it wasn't particularly praiseworthy. For a 2009, this Castelvero Barbera D'Asti had no nose to speak of and it just tasted old. Shame really because Thud had cooked a wonderful bucatini dish (Neopolitan, I know) and the wine fell quite short. Oh well. But dinner was a fun event anyway because an old, school friend came to visit me and it's always fun to meet up with Mr. Ray. The weather continued to be difficult yesterday and only cleared up just before sunset, which turned out to be stunning. It was cold and extremely windy with a constant drizzle, so the entire family decided to go out for ice cream. Tough us English. The relative scarcity of my blog posts can only mean one thing...I'm relaxing. Arrived in chilly England just fine last Friday. Immediately started having fun with family and friends, as it was my niece's 4th birthday. Lots of cake, jellies and sweets (and more cake), featured prominently through my first three days of being here, but not a drop of wine. I even got to see the sun (and the bluest of blue skies) for a few hours, but it's still extraordinarily chilly. Ahh...spring in England! ...to where I once belonged, Part 4. Liverpool's calling. I know a visit to my hometown is a tad overdue when a mere crossword puzzle clue can make me feel a little bit homesick. See ya tomorrow old city. Now that's a cover crop! Why plant silly (and potentially harmful) mustard as a cover crop when you could sow every other row in the vineyard with California poppies (Eschscholzia Californica)? Whilst poppies don't have the biomass of a legume, for instance, they do have a large taproot which could help condition the vineyard soil somewhat. Besides, they just look gorgeous. It's getting close to my annual trip home to Blighty. I'm getting excited. To help me get in an English state of mind, Vinomaker recently included Halfpenny Green Vineyard's, 2009 Penny Red in a blind tasting he put together for me. The Penny Red is a blend of Pinot noir (okay), Dornfelder (who? ), Triomphe D'Alsace (what? ), and Rondo (why?). OMG! Nose - hot dust, spice and oak. Floral, perfume, green beans. Thin, tart with a little berry - acid nice. Variety??? Draw your own conclusions, but just let me add this: there's no place like home. ...and it's not even Lent. Yes, I bought this bottle of wine because I liked the shape of the bottle. I'm so shallow! But hang on a minute, the $10 I forked over for this bottle of Pescevino was well worth it. Well, it was worth it after the initial sulphurous-blitzkrieg blew off - then it was a perfectly quaffable glass of white table wine and wasn't in the least bit pesky. A blend of 60% Verdicchio del Castelli di Jesi Classico, 30% Trebbiano delle Marche and 10% Chardonnay, this uncomplicated fish-juice paired quite well with my shrimp-fettuccine dinner. I may be shallow, but I'm not a snob. Napa is hosting it's first ever music festival this weekend. 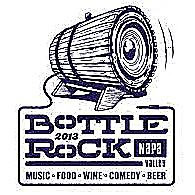 BottleRock billed as "the biggest thing to hit Napa since the grape" is being held at the Napa Expo (fairgrounds). In addition to good, old rock'n'roll there will also be a smattering of comedy acts performing and lots of wine thrown in - it is Napa after all. It is estimated that 35,000 people will attend the festival on peak days, so there has been a fair amount of grumbling from local residents and merchants who fear that navigating the east side of the city will nigh be impossible. I am a little concerned myself about being able to get my grocery shopping and errands done over the next few days, as I have to cross that area to get into town. At $599 for a four day pass the cost of admission was seen as a bit steep for many locals, especially younger folks who one would think would be the demographic that the organisers would have targeted. (To their credit, the organisers getting wind of this perceived blunder hot-footed it over to the college at the beginning of the week and donated 200 free tickets to the students.) Further, from what I hear, not a lot of people recognise many of the bands that will be appearing. I had a quick gander over the list of featured artists and had heard of only a few; Jane's Addiction, The Black Crowes, Joan Jett, and Blues Traveler. Oh, and Dwight Yoakam..."who?" said Vinomaker. I do like their logo though. Today was not a particularly good day in Vinoland. We had quite a bit of rain this afternoon - so that's the most recent application of sulphur washed off. Drat! And my day began with the sight of two deer parading around the vineyard, munching on the Pinot grigio and Cabernet Sauvignon shoots - the shoots that I had painstakingly spent all weekend stuffing up under the trellis wires. Double drat! The panicked, young buck repeatedly rammed the deer-fence in an attempt to escape and was looking a little worse for wear by the time he finally exited through the main gate, which Vinomaker had opened for that purpose. It was a most upsetting day. A single short-stemmed grape flower. Ta-dah! Of course, there are other flower clusters in the Pinot grigio vines that have a lot more bloom going on (and in the Orange Muscat). I just thought this lonesome flower looked like it was in a rather jubilant mood and not in the least, well, lonely. It was overcast and sprinkled for about 30 seconds this morning which, along with the low 70s temps, was a pleasant change to the low 90s we have been having. A very enjoyable afternoon was spent suckering the Cabernet Sauvignon vines. But no more rain now, thank you very much, we're flowering. Afternoon in the Vineyards: 2013. Today was the 13th annual Afternoon in the Vineyards, a casual meet-and-greet event sponsored by the Napa Valley Vintners that allows Napa Valley residents to get up close and personal with their friendly, neighbourhood viticulturist/vintner. Vinomaker and I decided to pop over to Ackerman Family Vineyards which is a stone's throw, well, maybe two stones and two throws, from Vinoland. The past couple of days I have been busy suckering vines, so this was to be a pleasant diversion. It was a glorious day, maybe perhaps a little too warm to be stomping around a dusty vineyard other than my own little corner of Eden, but I always enjoy visiting new vineyards...besides there are usually wines to be sampled. The Ackerman family have a very nice vineyard which is planted to modified-lyre, head trained, cane pruned (the tour guide's description, not mine) Cabernet Sauvignon vines and is certified organic (don't get me started). A lot of rescue horses (the horse-stall barn was very fancy). And a nice location with extensive Coombsville vistas. Unfortunately, the two vintages of their Cabernet Sauvignon that I tried, the 2007 and 2008, both wonderful vintages for Napa in general, were not to my liking. Both wines displayed stewed-fruit characteristics which, given the relatively cool climate in Coombsville, I can only attribute to something amiss in the winemaking department, perhaps. But then, what do I know? I just know they weren't to my taste...beautiful property though. I have been having fun trying some older vintages lately, but it's been hit or miss. Older wines can be great, or really bad. This 1959 bottle of Domaine Burrier Pouilly-Fuissé, from the cellar of Vinomaker's father, will remain unopened. I have no desire to ingest this wine; the volume of the bottle has decreased by about a third over the last 54 years, the wine is very brown, and it scares me a little. The capsule has really deteriorated and the cork resembles something that one would find growing on a dank forest floor. This bottle is best left alone. The Burrier family are still working their Burgundian magic on Chardonnay to this day, but even if this wine was a more current vintage I'd still be reluctant to try it. I'd take a stripped down Chablis any day over the oakiness of the Mâconnais.